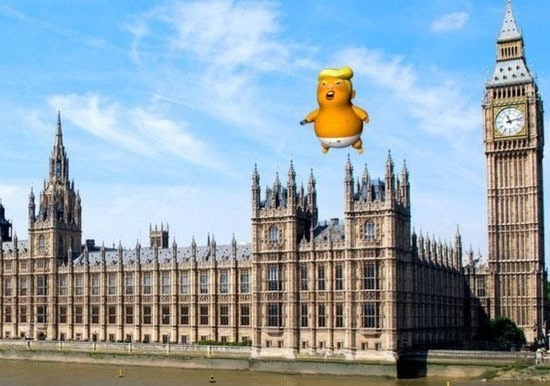 Both the conservative government sided newspapers and various politicians were quick to voice their displeasure at London Mayor Sadiq Khan’s approval to allow a giant inflatable balloon depicting US President Donald Trump as a diapered baby to be flown over the British capital during the First Couple’s visit on 13 July. Meanwhile many of Mr Trump’s most ardent supporters are calling on him to cancel the visit altogether. Speaking on BBC's 'Any Questions' program, Baroness Ruth Deech stated that although she admits the current US President is somewhat unusual in his ‘diplomatic’ endeavours, the London mayor had no problem allowing Turkish President Erdogan or Saudi Arabian King Salman, both of whom are accused of far worse atrocities towards both their own citizens and the world press. She also feels this is becoming more of a personal vendetta of the Labour sided mayor who, of course, has lots to gain for his own political following should the current conservative government fail in its endeavour to get a favourable trade agreement with the US. Even though the press is furious over Mr Khan’s allowance of the blimp, a spokesman for City Hall explained that: "The Mayor supports the right to peaceful protest and understands that this can take many different forms. His city operations team have met with the organisers and have given them permission to use Parliament Square Garden as a grounding point for the blimp." The launching of the balloon during Mr Trump’s visit will even coincide with a "Stop Trump" march in central London which he also allowed to carry on. Prime Minister Theresa May has not yet reacted to Mr Khan’s plans for the visit of the US President. The emir of Londonbad continues his part and parchel style of rule. Does the Shah of London control British Air Space, or does the British Government? Sadiq Khan is not fit to be Mayor of London. Insulting our best Ally and trading partner is not British. Before insulting the USA he should go to the American Airforce Cemetry at Cambridge and realise tat without the USA there would not be UK as we know it. He certainly wouldn't be Mayor of London!